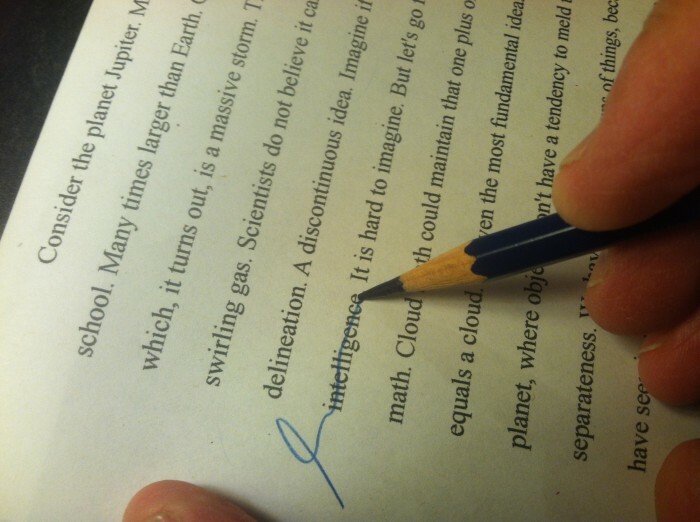 C. edits a manuscript with his Col-Erase blue. We met at a small vegetarian cafe in a New England town overrun by antique shops. By arrangement, he and I were the only two customers. “The owner and I go way back,” he told me. So we were allowed to chat inside for an hour before the place opened. He asked for a slice of strawberry rhubarb pie and ”a coffee, brown.” I got a coffee as well. “You’ll be sorry you didn’t order the pie,” he said. He wishes to remain anonymous, so, when I get tired of pronouns, I’ll call him C. He worked in various aspects of the publishing world for over two decades, and he agreed to talk with me about the pencils. “Do you know what color Perkins really used?” I asked him. He thought for a minute, savoring a forkful of pie a little too demonstrably—teasing me, and then changed the subject. He told me that two weeks after coming ashore, he had spotted a classified ad in his local newspaper: PROOFREADER WANTED. C. was the only applicant for the position, and the day after his interview, he had a job proofreading for a small vanity press. He wouldn’t describe any of the books he worked on (except for a five-volume collection of stories told from the point of view of a duck, which I have not been able to find in my research). But he did tell me how he worked his way up in the company, later writing “jacket copy,” meeting with authors, and editing manuscripts. At the small press, he recounted, regular graphite pencils were the rule. “Probably Dixon Ticonderogas. The office supply closet was full of them.” He found himself wondering when he was going to see, or maybe even get to use, one of the legendary blue pencils. Eventually C. became a freelance editor, and borrowed the color system for his own purposes. He used different colored pencils for different stages of his own editing process. He could tell when and why he had made certain notes, based on whether they were red, blue, green, or, in one case, brown. He told me that the colors were “100% pragmatic,” and said that using a different color never effected what he was writing. He only worked with Col-Erase pencils. After trying a few different brands, he refused to use anything else. C. sharpened a dozen pencils—every pencil in the box—each time he sat down to work. He would set them down on one side of the desk. When a pencil needed sharpening, he put it on the other side. This way he wouldn’t have to interrupt himself during long sessions. Using the different colors allowed him to stay focused on particular goals, compartmentalizing and essentially color-coding his time. “So you don’t know what color pencil Max Perkins really used?” I asked. I waited for him to say more. “That doesn’t sound 100% pragmatic,” I said.